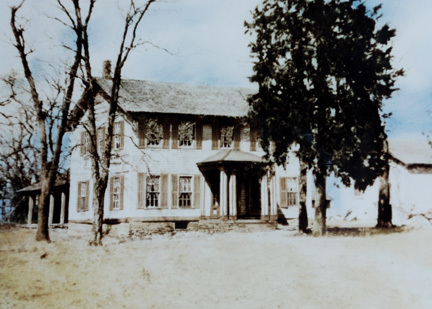 Andrew Jackson Farmer (1832-1915) and his wife Catherine Nance Farmer (1841-1890) built a two story rock home near Cato in 1870. This rock structure still stands today. The house was built with rocks from nearby Drywood Creek. Horses were used to drag the rocks to the location of the house, about 1/2 mile north. Ava Mae Spurling Adams, the great-grand-daughter of A.J. Farmer, said "My great-grandpa had a peg leg and he would climb a ladder to the secod floor of the house and count his money." A.J. Farmer and Catherine had 11 children: Isaac - 1858, Harriet - 1859, Charles - 1861, William - 1863, Melinda - 1864, Christopher -1866, Joshua -1868, John - 1872, Eaton - 1873, Albert - 1876, Sarah Bell - 1878, and Joseph - 1881. 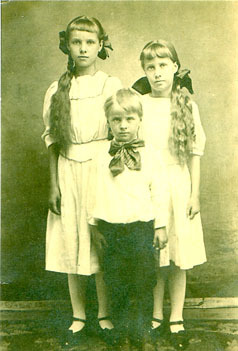 We need your pictures of Cato families and stories of their history. Please contact a Cato Historic Preservation Association member or visit our Facebook page if you have pictures to share. Thanks! "square & compass" on one end of the house. The house was built in 1872. Other rock structures included an ice house, smoke house, storage house, and a rock enclosed garden. Ruins are still standing in the field. 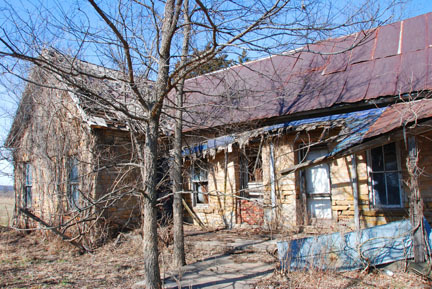 Great-grandson Rudy Simpson still owns the property. of the Cherokee Neutral Land on January 1, 1870. I.K. 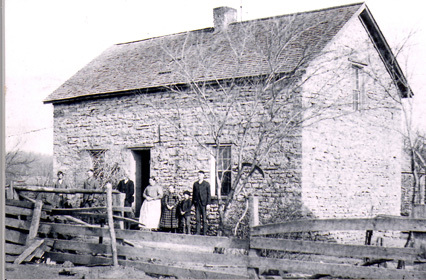 Brown came to Kansas from Illinois with his parents, Ezekiel and Cornelia Brown, and his brother, Chad, in 1857. He first settled near Uniontown, but moved south due to a severe drought experienced in the area. After serving in the Civil War with the 2nd Kansas Artillery, I.K. moved with his parents and brother to Cato. Brown was friendly to the proposed railroad through the section and incurred the enmity of the Land Leaguers, who threatened to hang him. I. K. married Eva Johnson in 1867 and had 6 children. His son, Owen, was a teacher at the Cato School. I.K. first built a log cabin and then the stone house and barn. The house and barn are both constructed of yellow coal bank rock. The rock walls of the house are two feet thick.